Curcumin, the main component in the spice turmeric, suppresses a cell signaling pathway that drives the growth of head and neck cancer, according to a pilot study using human saliva by researchers at UCLA's Jonsson Comprehensive Cancer Center. The inhibition of the pathway also correlated with reduced expression of a number of pro-inflammatory cytokines, or signaling molecules, in the saliva that promote cancer growth, said senior study author Dr. Marilene Wang, a professor of head and neck surgery and a Jonsson Cancer Center researcher. "This study shows that curcumin can work in the mouths of patients with head and neck malignancies and reduce activities that promote cancer growth," Wang said. "And it not only affected the cancer by inhibiting a critical cell signaling pathway, it also affected the saliva itself by reducing pro-inflammatory cytokines within the saliva." The study appears Sept. 15 in Clinical Cancer Research, a peer-reviewed journal of the American Association of Cancer Research. Turmeric is a naturally occurring spice widely used in South Asian and Middle Eastern cooking and has long been known to have medicinal properties, attributed to its anti-inflammatory effects. Previous studies have shown it can suppress the growth of certain cancers. In India, women for years have used turmeric as an anti-aging agent rubbed into the skin, as a palliative for menstrual cramps and as a poultice on the skin to promote wound healing. A 2005 study by Wang and her team first showed that curcumin suppressed the growth of head and neck cancer, first in cells and then in mouse models. In the animal studies, the curcumin was applied directly to the tumors in paste form. In a 2010 study, also done in cells and in mouse models, the research team found that the curcumin suppressed head and neck cancer growth by regulating cell cycling, said Eri Srivatsan, an adjunct professor of surgery and Jonsson Cancer Center researcher who, along with Wang, has been studying curcumin and its anti-cancer properties for seven years. 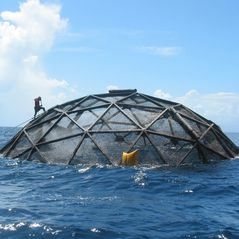 Srivatsan is a co-author of the current study. Curcumin has been found to bind to and prevent an enzyme known as IKK, an inhibitor of kappa β kinase, from activating nuclear factor kappa β (NFκβ), a transcription factor that promotes cancer growth. In this study, 21 patients with head and neck cancers gave samples of their saliva before and after chewing two curcumin tablets totaling 1,000 milligrams. One hour later, an additional sample of saliva was taken and proteins were extracted and IKKβ kinase activity measured. Thirteen subjects with tooth decay and five healthy subjects were used as controls, Wang said. 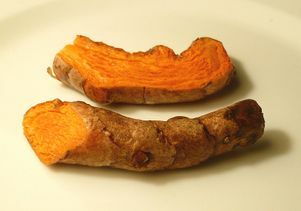 Eating the curcumin, Wang said, puts the chemical in contact not only with the cancer but also with the saliva, and the study found that the curcumin reduced the level of cancer-enhancing cytokines. An independent lab in Maryland was sent blind samples and confirmed the results: The pro-inflammatory cytokines in the saliva that help feed the cancer were reduced in patients who had chewed the curcumin, and the cell signaling pathway driving cancer growth was inhibited. "The curcumin had a significant inhibitory effect, blocking two different drivers of head and neck cancer growth," Wang said. "We believe curcumin could be combined with other treatments, such as chemotherapy and radiation, to treat head and neck cancer. It also could perhaps be given to patients at high risk for developing head and neck cancers — smokers, those who chew tobacco and people with the HPV virus — as well as to patients with previous oral cancers to fight recurrence." The curcumin was well tolerated by the patients and resulted in no toxic effects. The biggest problem was that their mouths and teeth turned bright yellow. "Curcumin inhibited IKKβ kinase activity in the saliva of head and neck cancer patients, and this inhibition correlated with reduced expression of a number of cytokines," the study states. "IKKβ kinase could be a useful biomarker for detecting the effects of curcumin in head and neck cancer." 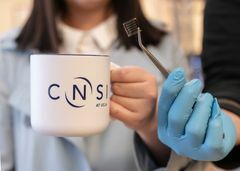 The next step for Wang and her team is to treat patients with curcumin for longer periods of time to see if the inhibitory effects can be increased. They plan to treat cancer patients scheduled for surgery for a few weeks prior to their procedure. They'll take a biopsy before the curcumin is started and then at the time of surgery and analyze the tissue to look for differences. "There's potential here for the development of curcumin as an adjuvant treatment for cancer," Wang said. "It's not toxic, it's well tolerated, cheap and easily obtained in any health food store. While this is a promising pilot study, it's important to expand our work to more patients to confirm our findings." Finding ways to better treat head and neck cancers is vital, as patients often require disfiguring surgery, frequently losing parts of their tongue or mouth. They also experience many side effects, including difficulty swallowing and dry mouth and have the potential for developing another oral cancer later. The study was funded by Veterans Affairs Greater Los Angeles Health System, the West Los Angeles Surgical Education Research Center, the UCLA Academic Senate, the National Institutes of Health, and the Veterans Administration. 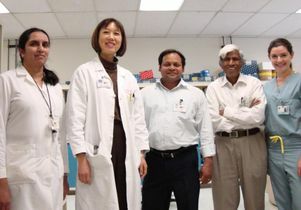 Dr. Marilene Wang (second from left) an her team of researchers at UCLA's Jonsson Comprehensive Cancer Center.